By now, I had used every single shirt and pair of pants I had with me, so we needed to get some washing done. We woke to rain though, which wasn’t going to help the cause very much! None the less, we boiled some water and washed a big load of washing. I set a clothesline up between 2 trees using ratchet straps, and hung the clothes up to dry (after spending a long time trying to ring the water out of them). Not more than 5 minutes after we had finished the rain started coming in, which was a bit of a laugh. With no one around, could you get much better? We ate breakfast, and headed off towards Walpole, where a 4WD track goes out to Rame head. The track was a bit of fun, and led to some incredible coastline where no doubt the fishing would be second to none. We headed back in, keen to visit the Valley of the Giants Tree top walk. $15 each adult and we were set to walk through the trees. 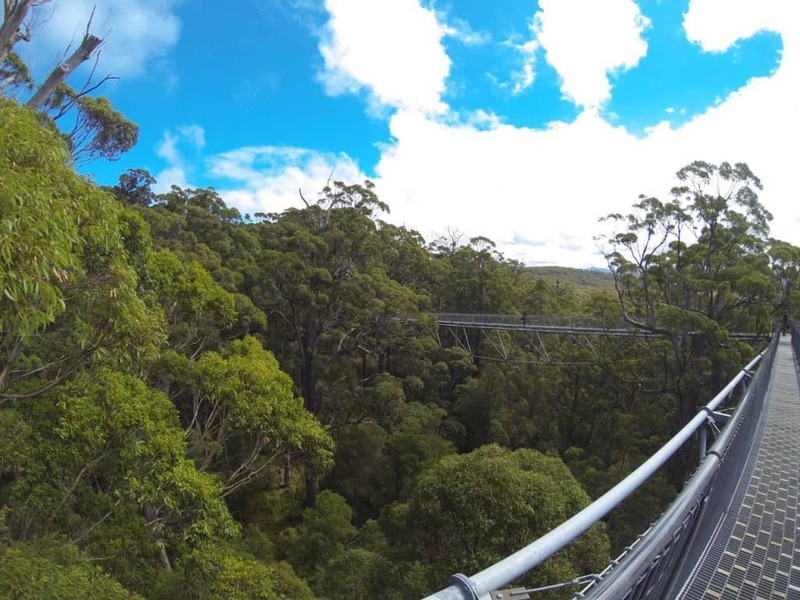 The tree top walk takes you up around 15 – 20 metres above the ground, and through some of the huge tingle trees in the area. From there, you can head to the ancient tree walk which takes you on ground level past some more massive, incredible trees. These have very fragile root systems meaning you can’t walk near their trunks without seriously damaging them; board walks have been set up to allow free passage and great viewing. You wouldn’t be complaining, would you? 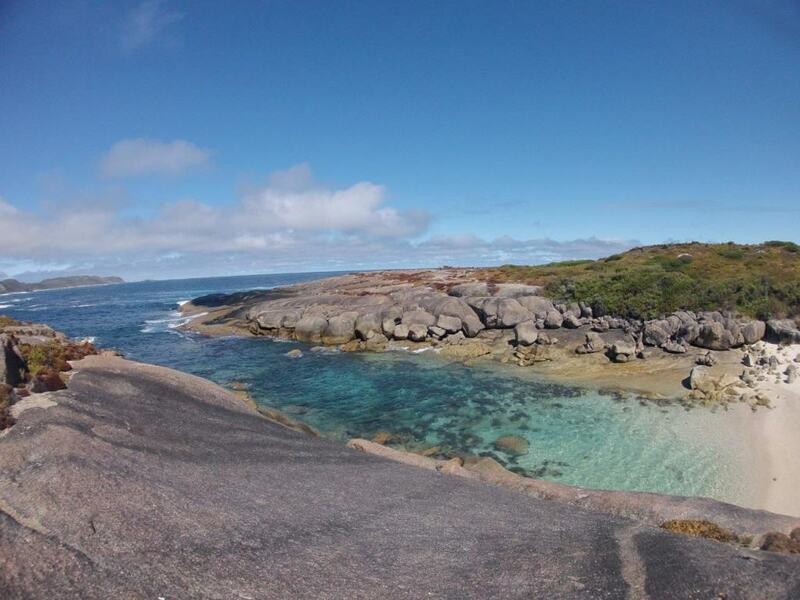 After the tree top walk, we headed to Boat Harbour, which is a little beach in between Denmark and Walpole. The first few km are gravel, and after that it is 4WD only. We arrived onto the beach, which is as perfect as you can imagine, and ate lunch on the rocks, overlooking another beach no more than 15 metres wide! I couldn’t resist going for a dive, so coaxed Sarah into the water for a while. Surprisingly, the water didn’t actually seem freezing; maybe we have gotten used to it! We went to a fishing spot on the way out which was insane with huge swell and big rocks, and headed back towards camp. 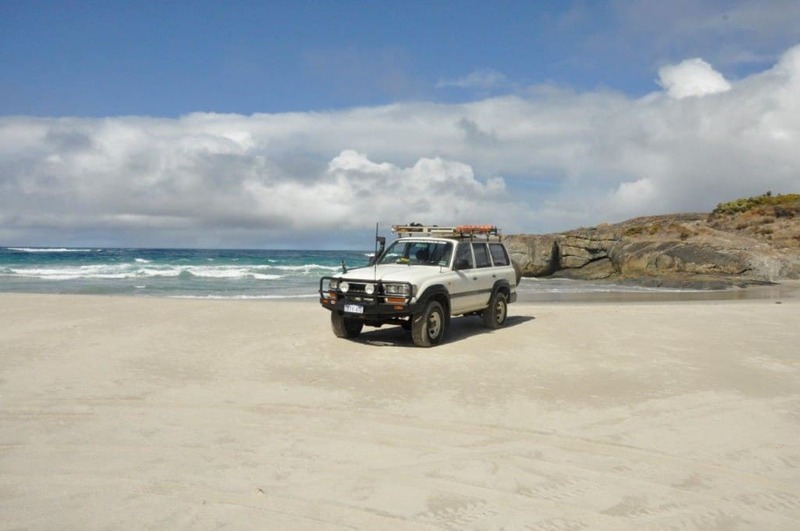 On the way back to camp, we decided to check out Eagles Nest, which we were told was an extremely difficult 4WD track onto the beach where some great fishing could be had. We made it in at 15 PSI with relative ease, and the coast here was pretty wild. I imagine it would be good fishing for bigger fish. There are a couple of sections on this track that I imagine would be very difficult if it had been chopped out more, but there is a bit of rubber matting which does help. Back at Parry Beach, we continued onto a little beach just around the corner. This is another gorgeous beach, but we were running out of time and headed back to camp. We had hot showers from the solar showers and then went for a walk along the rocks at Parry Beach. A number of people were fishing there, and we could see Salmon jumping out of the water. None seemed to get hooked though, so we left to get back to camp! Sarah cooked up a mean Chicken pesto pasta, and we relaxed and hit the sack.